Get your apron on! This could get messy. 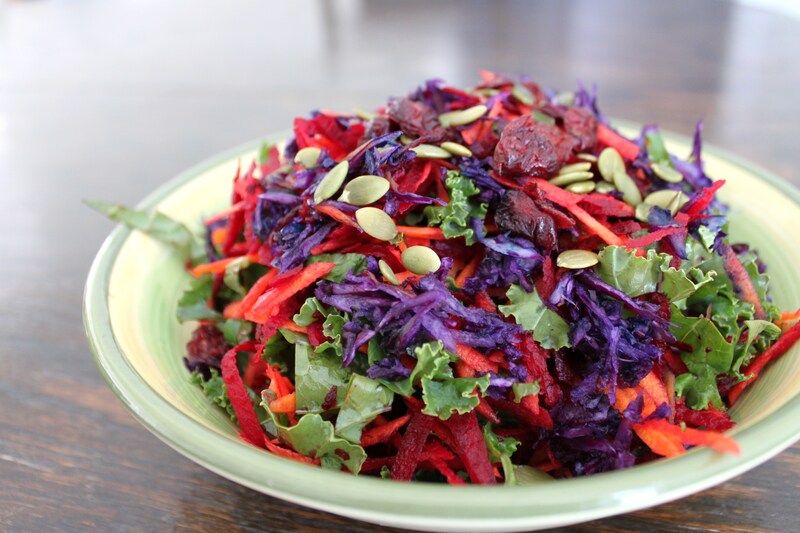 This salad is so healthy and colourful. Excellent for a light lunch or as a side. Chop kale thinly and rinse and dry. Grate the carrot. Cut the ends off of your beet and use a potatoe peeler to peel the outer skin off. Chop in half and grate the half into thin slices. Grate the purple cabbage. Toss all ingredients into a large bowl to combine, then add desired amount to your serving bowls. Sprinkle with pumpkin seeds and dried cranberries to your liking. In a blender add balsamic vinegar, olive oil, garlic, dijon mustard, 1/2 avocado and salt and pepper. Blend until smooth. Use as a dressing for your salad.